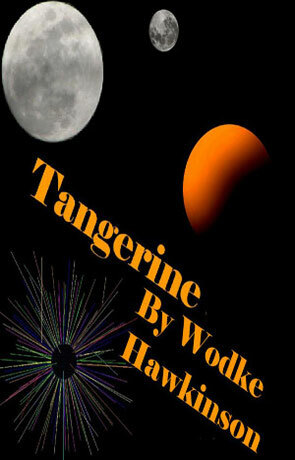 Tangerine is a science fiction novel by PJ Hawkinson and K Wodke collectively known as Wodke Hawkinson. Set in a future time where long distance space travel is commonplace and aliens are a natural part of society, Tangerine is a story of the interstellar biologist Ava who explores the wild orange beauty of the planet, Tangerine. Accompanied by her furry space companion and a romantic rogue, she discovers that she is the heir to a device of great power and she is hunted by a overpowering collector of antiquities. Tangerine is a well written, descriptive novel that manages to capture the imagination, the plot is well laid out and the pace enough to keep the interest, although it is fairly sedate. The world building is very impressive with rich descriptions of the titular planet and it's glorious flora and fauna. We get some technical background about the future setting, space travel is a reality after the discovery of "dimensional displacement" and humans co-exist with many different alien species, having travelled to many different planets. Space Travel is somewhat restricted though due to a severe toxin that kills randomly and mercilessly, found on many unknown and uncharted planets. To date there has been no cure or inoculations found. This has meant that exploration to any new solar systems or planets has been curbed and most travellers only journey to established colonies that are known to be clear. One of my favourite ideas in the book is that of the space companion, the vastness of space can cause severe physicological issues for the lone traveller and so an intelligent non human companion is encouraged. While the technology is well explained the details are kept brief, the novel certainly isn't in the "Hard Scifi" sub genre. The story is very much character driven, richly detailed the characters really shine through the novel and elevate the story above the average. The interplay between the two main protagonists is just great, and glues you to the story, it's a fairly short book but very little is wasted, clearly being well edited and proof read. Tangerine is a tight, captivating character driven story that should appeal to all, recommended. Written on 10th January 2011 by Ant.